COLUMBUS, Ohio — The ATA Trade Show is the only archery and bowhunting show that dedicates net revenues to fund archery and bowhunting programs, projects and industry growth. This means every company that attended the 2010 Show made an investment in its own future. "Such funding wouldn't be possible if the ATA didn't own and operate the Trade Show," said Jay McAninch, ATA's CEO/president. "Before the ATA took over the Trade Show, we were paying about $400,000 each year just for staff to run the event. Back then, the net revenues from the Show were 20 percent of what it is today. As our members have seen, we reduce costs by using our own staff and volunteers wherever possible and we focus on creating forums for business rather than coordinating social aspects of this gathering of industry professionals." 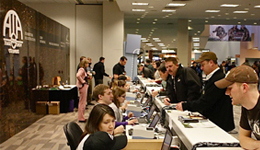 The 2010 Show, Jan. 13-15, drew 12 percent more attendees than in 2009. Conservative estimates indicate the event generated $8 million to $10 million in direct spending by Show attendees in Columbus, Ohio, a substantial economic impact. The event creates a ripple effect that benefits not only the host city, but also long term efforts that extend far beyond the Show itself. Over the past five years, the ATA has invested and pledged nearly $2 million to bring introductory archery and bowhunting programs and shooting facilities to U.S. cities, while the group also works to sustain and grow bowhunting. Contributions to the Easton Sports Development Foundation Centers for Archery Excellence. The centerpiece of ATA's efforts to grow archery and bowhunting is its Community Archery Strategy, a concept that typically begins with the development of an archery shooting park and facilities where archers can participate in shooting year-round. This is followed by a concerted effort to establish introductory archery and bowhunting programs into schools and local recreation programs. "That's why we built four archery parks from scratch the past two years, and already have the paperwork complete to build four more," said Stuart Goldsby, regional hunter education coordinator for the Alabama Division of Wildlife and Freshwater Fisheries. "Archery parks tie together all our community archery programs, whether it's NASP, rec programs, bowhunting clubs or bowhunter education. The parks become the hub for all archery activities." The ATA strategy for archery success isn't just "Location, Location, Location." It's also repetition. Once kids and other beginners are introduced to archery, the ATA works to ensure those same kids have programs that allow continued participation, access to archery shops and equipment along with ranges to keep them in the sport. "Our vision is to push the arrow sports onto the same plane as the ball sports - golf, tennis, baseball, hockey and soccer - and then sustain their growth far into the future," McAninch said. "ATA is working with our civic, corporate and agency partners across America to build archery shooting facilities, refurbish existing ranges and launch an array of archery and bowhunting programs." Key to the ATA's Community Archery Strategy is its effort to embed archery not only in schools, but also in city and county recreational programs, retirement communities, Boys and Girls Clubs, conservation and shooting clubs, and any other group with indoor or outdoor facilities that can accommodate archery. "Basketball courts, tennis courts, golf courses, baseball diamonds, soccer fields, swimming pools, football stadiums and other facilities ensure wide participation in the mainstream activities because federal, state and local governments provide much of their funding and maintenance," McAninch said. "Our strategy is to be sure the same access to facilities exists for archery." Less than one month before the 2010 Trade Show opened its doors in Columbus, the ATA hosted its 7th Archery and Bowhunting Summit in Nashville, Tenn. There, representatives from nearly 30 state and federal wildlife agencies met with partners from community-based and youth-oriented archery programs to share and adapt strategies to convert newcomers into lifelong archers and bowhunters. Archery's diverse partners continue to expand their Community Archery Strategy as part of the ATA's work to make archery a mainstream sport. Alabama, Florida, South Dakota, Nebraska, Iowa, Nevada, Tennessee, Arizona, New Jersey, Michigan, Minnesota and Alaska are examples of states where proceeds from the ATA Trade Show were used for new archery programs and archery parks, shooting facilities and archery ranges. For more information about the ATA Trade Show or the Community Archery Strategy, please e-mail info@archerytrade.org or call (866) 266-2776.